Often times, a cocktail will illicit a memory. Manhattans take me back to my hopeful college days, where I worked as a waitress, catering to a sophisticated retro crowd that also ordered stingers and gimlets. Martinis take me back to my travels with co-workers and good times we had around our love of vodka in what seems like another life ago. 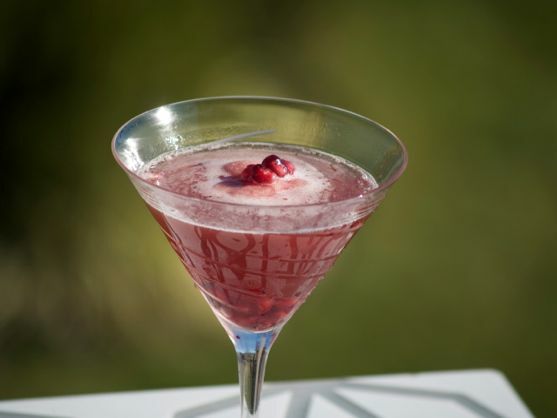 This Pomegranate Christmas cocktail takes me back to December 1, 2009, when I hosted an online food bloggers event to remember those who died of AIDS. It was called Red to Remember and many food bloggers participated in raising awareness by cooking a red dish which was posted in this round-up. This year I meant to post something red again in time for World AIDS Day, but something terrible happened. I didn’t remember, at least not in enough time. I could have kicked myself a bit because I should have kept “Red to Remember” a yearly event. My memory was jogged when Kristina, a fellow food blogger, not only remembered World AIDS Day, she remembered me and my story with a private tweet. Her compassion jolted my senses and I took a moment to grieve and reflect before I jumped over to her blog, Former Chef, to find her latest post, a lovely cranberry cocktail. It was red and took my breath away. I remembered my original red to remember post, pomegranate sorbet made with dark rum had an accompanying cocktail that never got any love. I think it was waiting for today. On December 1, World AIDS Day was mentioned in the news . Some of it was heart warming, some confusing. The biggest news of the day was that of a 13-year old honors student who was denied access to Milton Hershey private school on the basis of his HIV positive health status. The decision is controversial and there is a petition circling, asking the school to reconsider. The news struck home because I grew up near the Milton Hershey campus. It reminded me how destructive this disease is beyond the physical implications. The private boarding school, established in 1909, was started to help underprivileged deserving students have a better chance in life. It’s a big mess, a law suit has been filed, and a new dialogue on living with HIV is taking place. The irony of the lawsuit is Milton Hershey’s affiliation with Hershey Foods, which not only owns Hershey Chocolate but other boutique brands like Scharffen Berger, a favorite of many food bloggers. Reading the history of Hershey is fascinating on many levels, and it will be more interesting to see what comes of this current controversy. I have just traipsed through the muddy waters of a personal story, but I try to keep it real. It still makes me nervous to talk about it, but I can’t seem to let it go. This post was ready for days, but I had hesitation because I know the stigma still exists and it’s uncomfortable. Perhaps this was my way of coping with loss during the holidays. This still a Christmas cocktail, and I raise my glass to the two men I have dedicated this blog to. Sometimes there is a joy inside a sadness and this Pomegranate cocktail will always have a special meaning and memory for me. Tell me, do you have a certain cocktail that reminds you of a significant time in your life? The Pomegranate Christmas Cocktail is refreshing as a starter with appetizers but is also a great dessert, because of the sorbet. A cocktail to remember World Aids Day, made with sorbet and champagne. Put ¼ cup sorbet into martini glass. 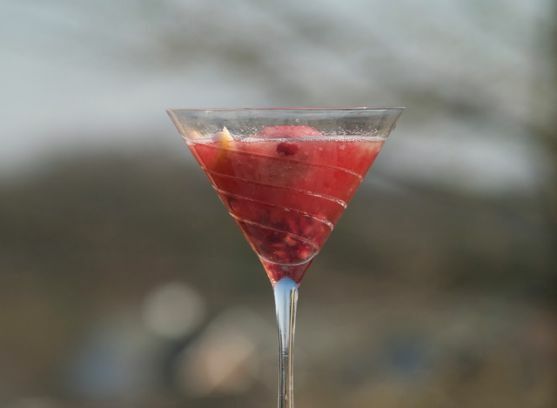 Freeze pomegranate sorbet in martini glasses or dessert long stem glasses. Pour champagne in as you serve. Keep in mind this sorbet is made with dark rum, so it's extra good. Pour champagne in as you serve. Keep in mind this sorbet is made with dark rum, so it’s extra good. Count on me for next year…..
What a beautiful cocktail! And a great post! Thanks for sharing the story. You always ‘keep it real’…that’s why I keep coming back. That – and you cook good too! I’ll be happy to participate again next year if you want to calendar another Red to Remember event. A beautiful heartfelt post Angela. Every year and every so often I silently read off the staggeringly long list of names of those around me we lost. I can’t say “I lost” I have to say “we lost” because I believe it’s the world’s loss they are not alive today. All the kindness, humanity, unexpressed art, undiscovered science and uninitiated social activism that died with them is tragic. Those souls influenced and shaped who I was in the 80’s and early 90’s and who I am today. Hopefully the Milton Hershey debacle will foster future clarity and understanding. and I hope this keeps happening until every shred of prejudice, fear and hate is eradicated for people living with AIDS. Whenever you again choose to dress your blog in red to remember, I am here. In the meantime I will raise a glass and take a delicious virtual sip of that lovely pomegranate cocktail. Lora, you are such a beautiful person and I so much appreciate what you wrote here. I feel like you are a sister who understands and you make the most beautiful food too. Lovely post for a very important thing to remember…each year and every day and a beautiful cocktail. Beautiful cocktail Angela. I remember your event a few years ago…it doesn’t matter that you forgot. I think this is a beautiful tribute! I remember cosmos in my college days too! It seems pomegranates are on everyone’s mind these days and for good reason… they’re so good… making a drink tomorrow… your’s looks so delish!!! On World Aids Day I did remember your event and our journey down that road together as a blogging community. I have never lost anyone to aids or even know of anyone who is struggling but I was touched by your post and your all too real loss. The drinks that I remember are from happy times but my favourite is still the Bellini from Joey’s where I get together with my “girls” and reminisce. What’s going on at Milton Hershey is not only sad, but unacceptable. I do hope they will come to their senses about that brave 13 year old boy.